You can set a television to rotate through your different queries on a dashboard. This is referred to as a rotating TV display . Similarly to flipping from channel to channel automatically, you can flip from tab to tab on one of your dashboards. You can pack each tab with visuals or add one query per tab for a large view of your reports. Rotating TV displays are a unique way of keeping everyone in your contact center or sales floor up-to-date. Note: To create a rotating TV display, you must have access to at least one TV and a Chromecast device, Apple TV with Airplay, or any other method for sending a screen from a computer to a TV. Before you can set up a rotating TV display, you will need to have already connected to data sources, built queries, and created a dashboard. If you have not completed these tasks beforehand, see Getting started . Click the Data sources library icon ( ). Select a connection used on the dashboard you would like to display. Adjust your cache refresh time to 0 or any lower frequency. Note: If your dashboard's queries come from different connections, you must repeat the above steps for each connection. Click on the Dashboard library icon ( ). Select the dashboard you would like to display on your TV. Ensure that your dashboard contains multiple tabs. You can either have tabs with several visuals or focus on one large visual per tab. 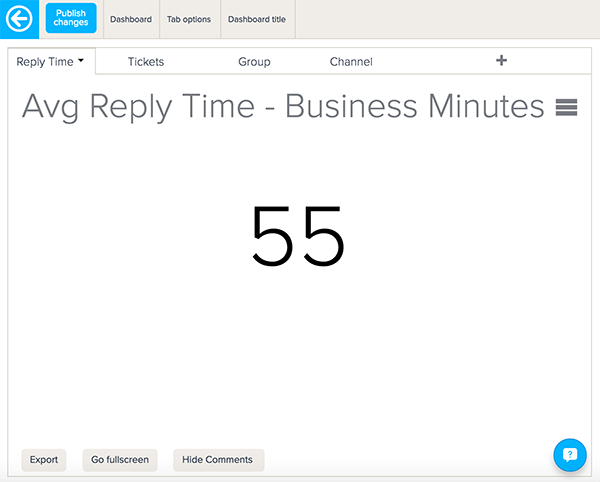 The example below creates tabs containing individual reports for average reply time, open tickets, the groups receiving tickets, and the channels receiving tickets. When you have completed creating your dashboard, click the Publish button ( ). Click the More options... link. 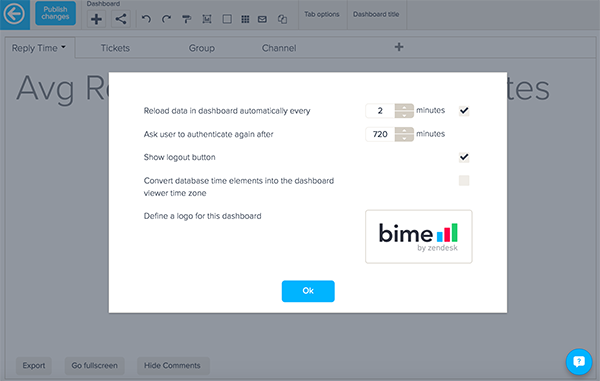 In Reload data in dashboard automatically every set the rate you would like your television to flip through tabs. For the first time you cast your dashboard to a television, it is recommended to select a lower loading time, so you can quickly test if your rotating display works correctly. Open your dashboard in an end-user view, then select your casting device. After you cast your dashboard, your television will automatically flip through your dashboard tabs.